Posted April 28, 2016 by thomasgrove & filed under Uncategorized. If you’re hoping I tell you to stop having fun on the weekends I’ve got some disappointing news for you. I love my weekends. I work hard and I play hard. I go to parties, concerts, festivals, spend time with family, occasionally Imbibe, enjoy my hobbies and go out to eat. What I do not do is lose my self discipline over the weekend and undo all my hard work. Below I will be cover 6 key points to a successful weekend. #1 Who you surround yourself with. You become who you surround yourself with. Sometimes we outgrow friends in life, or our lifestyles are no longer congruent with those who we spend our time with. Make friends and surround yourself with those who have a similar vision and goals on life as you do. *What kind of person do I want to be? *Are the people with who you spend the most time with congruent with who you want to be? Have a game plan for your weekends. Just as you do for you weekdays, except the weekend has more freedom! Its up to you how you use this freedom. Reprogram your subconscious mind for success. Every Thursday night(or every night) before going to bed visualize what you want your weekend to look like. Be specific and your subconscious will help you get there faster. You’ve sold yourself on showing up to work Mon-Fri, now you’ve gotta sell yourself on eating healthy and being active. You’ve lost the accountability and schedule of a work day, so this has to be your idea, and you have to mean it! You will find your weekends a lot more enjoyable and full-filling when you have a game plan and you will have a lot more energy if you eat healthy and plan your meals as well. 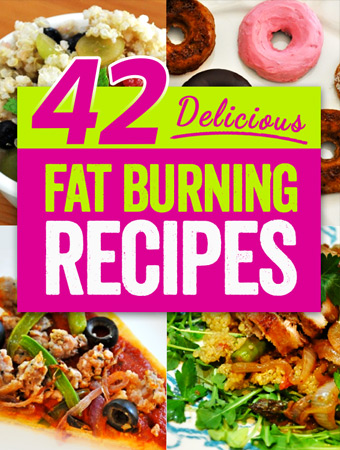 Check out www.amplifiedfitness.net/recipes for lots of great and easy recipe ideas! This could be an entire blog post on its own. Good thing I’ve already written one. Here’s a little tip for you. Eat your healthy planned meal before leaving. (Remember you plan your weekends now.) Socializing doesn’t have to be about eating. This way you won’t be going to the party wanting to stuff your face, or you can order a very modest portion if you are going to a restaurant. I often drink a protein shake before going to a restaurant to avoid arriving hungry, otherwise, game over. Bring on the unlimited basket chips and butter rolls! That bowl of chips and dip laid out on the counter won’t be teasing you all night and you won’t be having a mental tug-a-war if you leave not feeling hungry. “But what about all the people that offer me drinks and food?” The cool thing about nutrition is you are in control. If you want to accept, accept. If you don’t want to then don’t. You are not a people pleaser. You are a focused individual, that is relentless about their goals and dreams! If someone gets upset for you not accepting their food then they have their own issues to deal with. Don’t live by other people’s values. Set your own values and expectations of your life and meet them. #5 Do you work out? Working out, not just for the weekdays. If you struggle with bad habits on the weekends then you need to start working out on the weekends. I know it helps me knowing I have a workout at 9:00A.M Saturday morning to help me stay focused and prevent me from drinking too much alcohol or eating too much crappy food. You will learn that the hard way if you show up to workout after a crappy night of eating and/or drinking. #6 Don’t deprive/under-eat during the weekdays. This one could an entire blog post itself so I won’t go into too much detail here. (new content idea!). You should be training to fuel your body, not deprive it. Eat enough calories and small indulgences so by the time the weekend comes you are not mentally vulnerable and ready to ravage and entire pint of Ben and Jerry’s. If you’re finding yourself super disciplined during the weekdays then feeling very vulnerable during the weekends that is a sign you are under eating and depriving yourself. *Our coaches can get you on a done for you meal plan specific to your body and goals. How to get in shape with a high stress life. Posted April 11, 2016 by thomasgrove & filed under Uncategorized. But lived and died a scrubby thing. But lived and died as he began. The more the storm, the more the strength. In trees and men good timbers grow. We find the patriarchs of both. Of many winds and much of strife. This is the common law of life. Posted April 7, 2016 by thomasgrove & filed under Uncategorized. Enter your email below for your three free at home workout. Posted March 31, 2016 by thomasgrove & filed under Uncategorized. Wow another amazing month! Its going to be hard to keep this short. 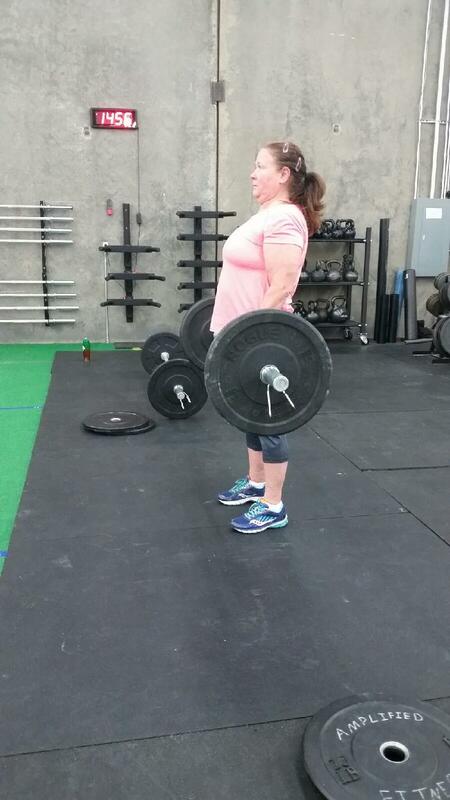 Chris doing her first workout with a barbell! 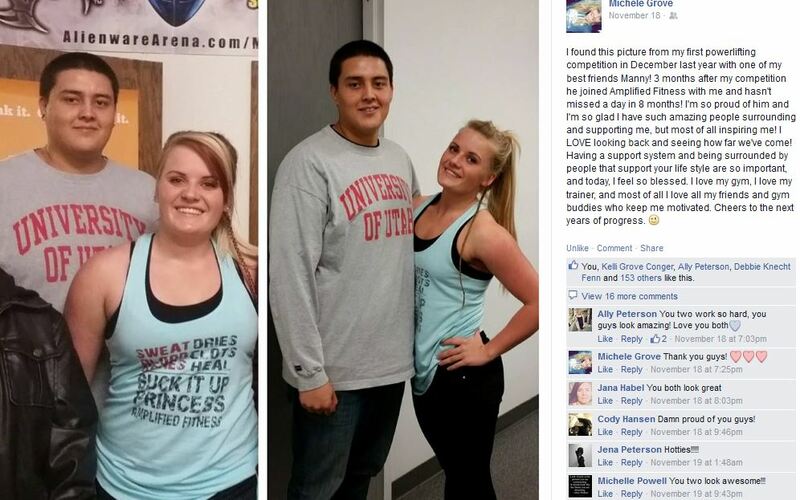 Manny’s 1 year anniversary at Amplified Fitness was at Amplified Fitness this montht! 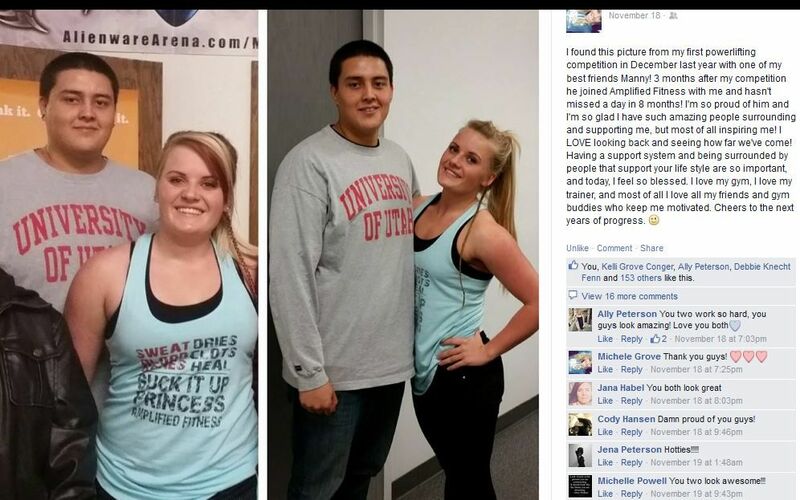 He’s lost 64lbs and is an absolute beast in the gym. Its been amazing and a privilege to be apart of his journey. More importantly he’s created a lifestyle change. He has definitely worked for it and embraced the Amplified Philosophy. One of our March reviews! 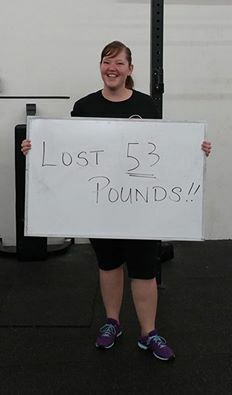 Amber hit her 6 month Gymniversary and has lost 53lbs! 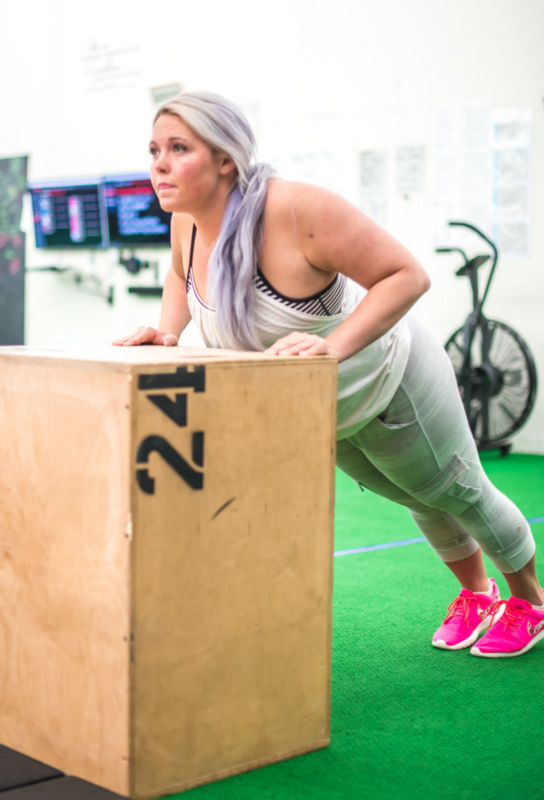 Even more important, more important than the lbs lost, the weights lifted and the personal records set is her commitment to making a fitness lifestyle and the habits she has developed. Our member of the month for March was Katie Prawitt! I could make an entire highlight real of just for her 😉 You can read her story here. 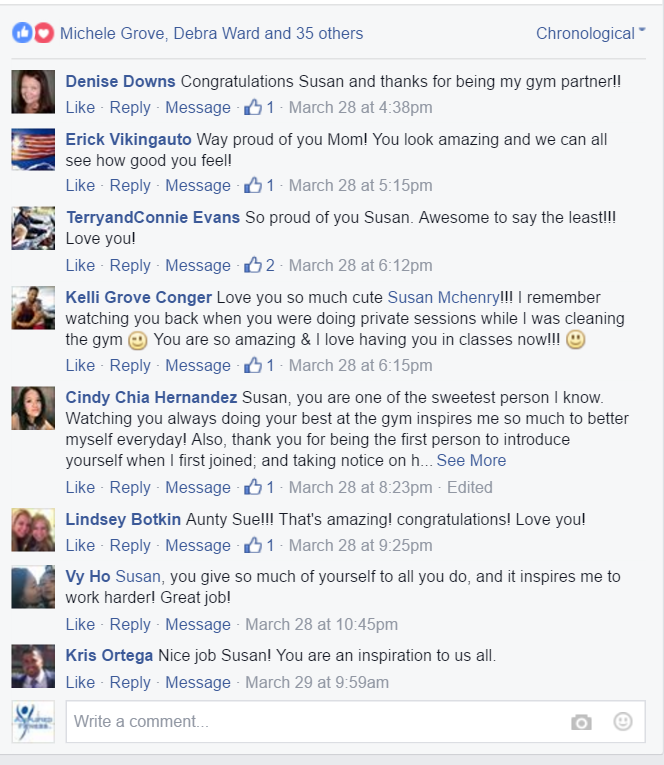 Susan was announced as member of the month for April. We are all very proud of her and so is her family! You can read her story here. 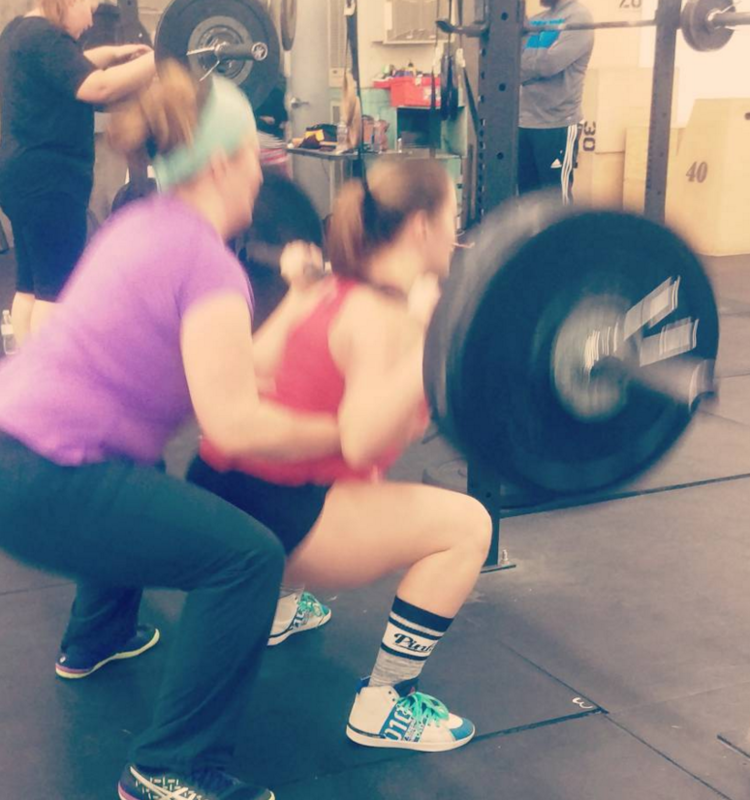 Nicole, 4 months pregnant and lifting for two! She’s stayed consistent through her pregnancy. So inspirational! I decided to add this to the highlight real because we are all at different stages in our fitness level. Maybe you just set a personal record on your 6th ultra ironman. 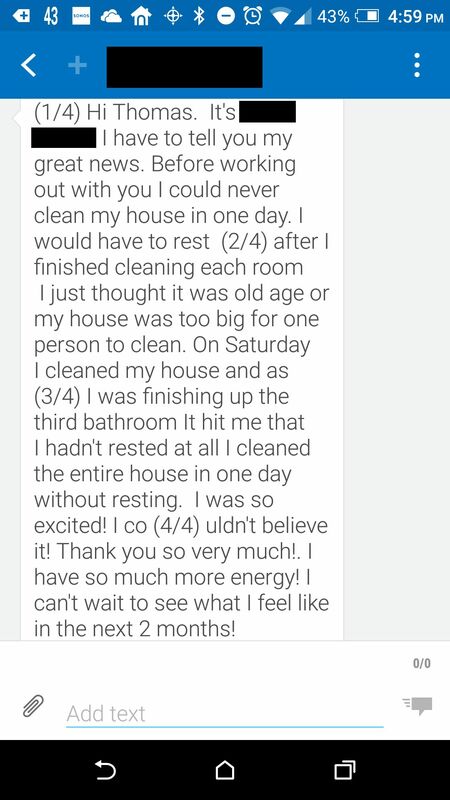 Or maybe you have lost enough weight and gained enough energy to clean your entire house! Either one you should be incredible proud of yourself. Celebrate every amount of progress no matter how small or large. Embrace the journey and the hustle. 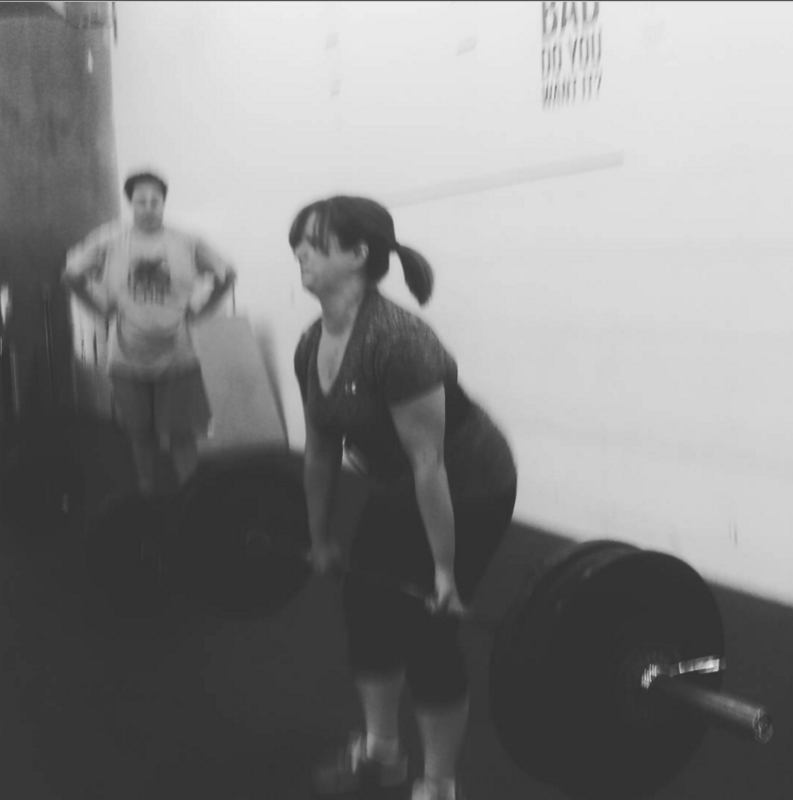 Denise has been working really hard in our beginners program and this month she deadlifted with a barbell for the first time! Michelle mother of 4 showing hard work does pay off! Our fit for spring challenge starts April 11th click the picture to learn more. 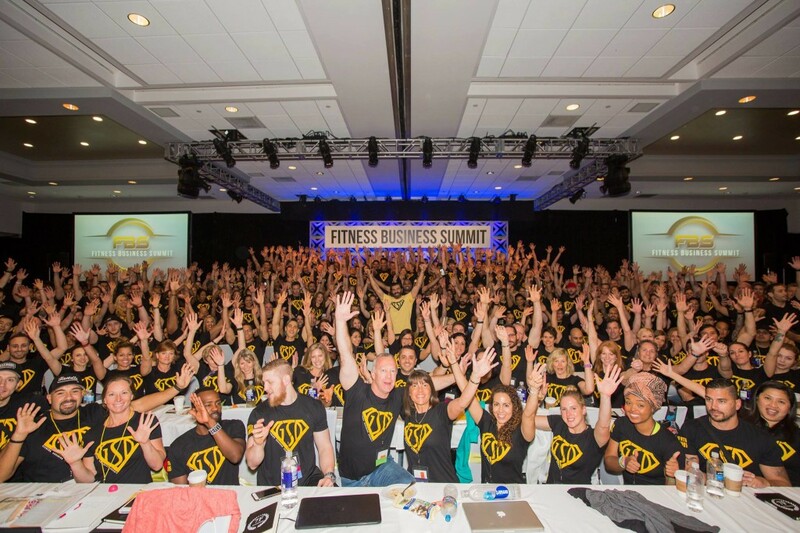 Coach and owner Thomas Went out to the Fitness Business Summit in Irvine California and brought back a wealth of knowledge to keep Amplified Fitness on the cutting edge of the fitness industry. We kicked the month off with a jump rope challenge! 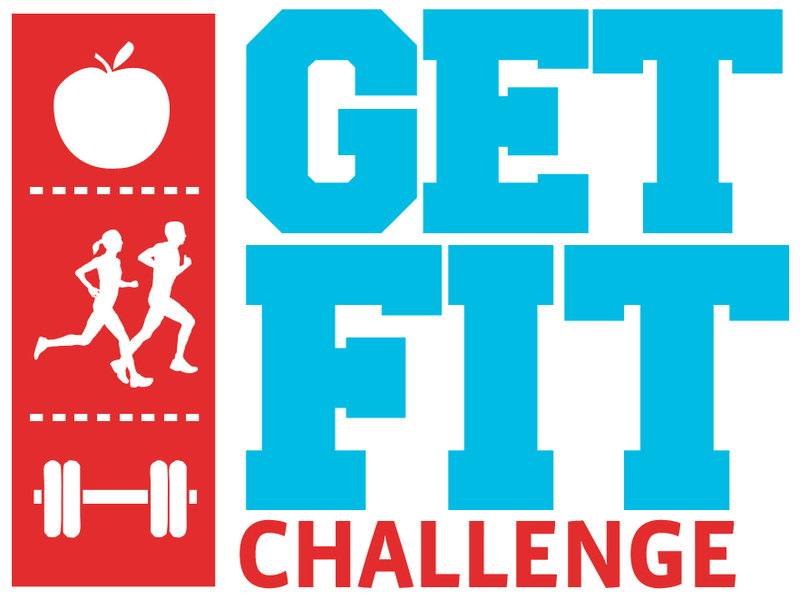 Anyone that completed the challenge had their proceeds donated towards the humane society of Utah. Here are a few of the challenge completions! 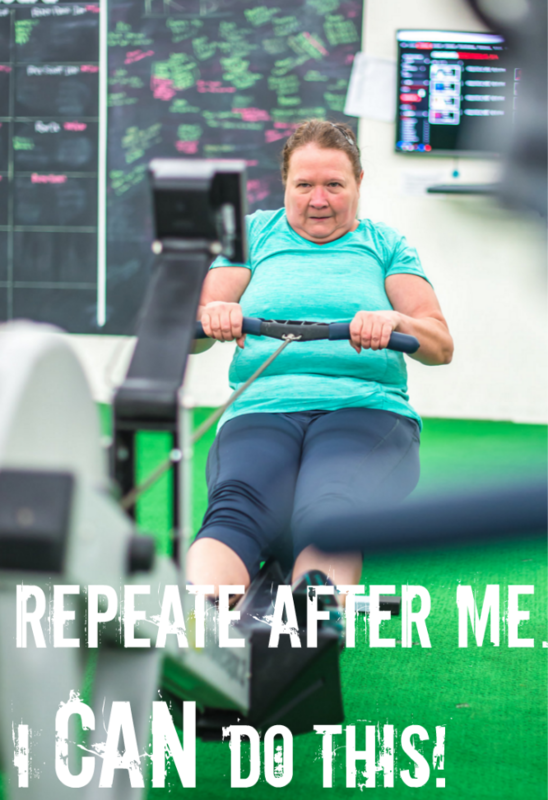 April Member of the month! Posted March 28, 2016 by thomasgrove & filed under Uncategorized. April’s member of the month is Susan McHenry! 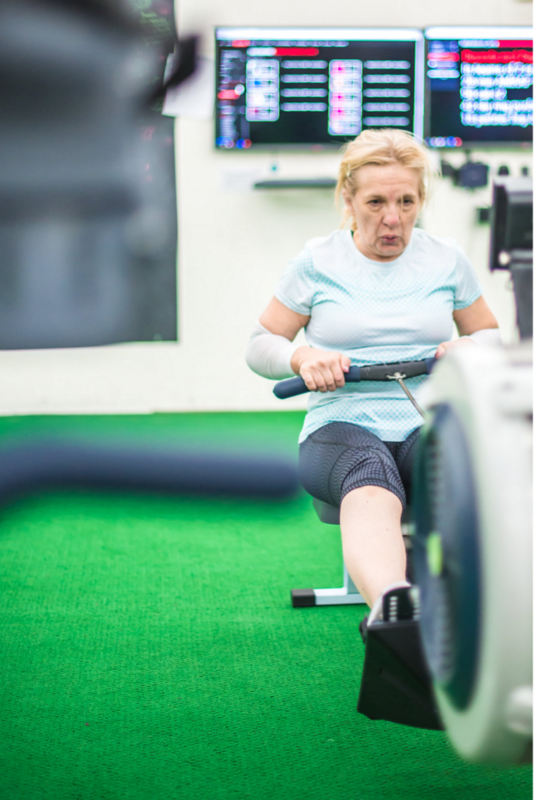 Which charity have you chosen for Amplified Fitness to donate to and why? Multiple Sclerosis Foundation (my brother-in-law is suffering with this). This affects the young and old and slowly kills those who have it. A brief history at Amplified Fitness. Tell us how you got started and your experience. Over two years ago, I knew that I needed to do something to improve my quality of life then and for the future. I had never exercised, play sports, etc. I looked and felt like a “little butter ball”. When looking at KSL.com classified ads I saw Amplified Fitness several times, but didn’t call. One day I told myself if I saw the ad again I would call. I did see the ad and called. I started with Tom doing one-on-one training for six months. I was uncoordinated, and had no strength or flexibility. I know I frustrated Tom(no you didn’t!) because I was so uncoordinated, I was a mess. However, slowly I made progress and tried a group class. I only attend three times weekly. However, in the last months I’ve tried to go at least of four or five times a week, workout in the early mornings and this is working for me. I’ve raised myself to a newer level and feel great! I’ve lost almost 50 pounds, many, many inches and have gained more strength, flexibility and the most important part is that I feel so much better. Also, a new wardrobe hasn’t been bad either!!! Least favorite movement? Least favorite workout? Wall Balls and the assault bike. Keep up my attendance to 4 or 5 times weekly and doing the best I can in every workout. Working out is also a mental workout and keeping myself in the right mental frame of mind is always a priority. My example, has an impact on my husband, children, grandchildren and friends and I want to always set the example. Anything else you want to share about yourself: what you do for fun, what you do for work? For fun I enjoy quilting. I’ve made hundreds of quilts, to me I see beauty in fabric and what I can do with it. I also love reading and road trips with my husband. I currently work only to keep me in fabric at a Charter High School (AMES) and work with students in the Counseling Office while they apply to college, and scholarship applications. I love working with the young people! What keeps you keep coming back for more? I never want to lose the ground I’ve gained in the last two years. I’m going to be fit, and strong for myself and family for the rest of my life. 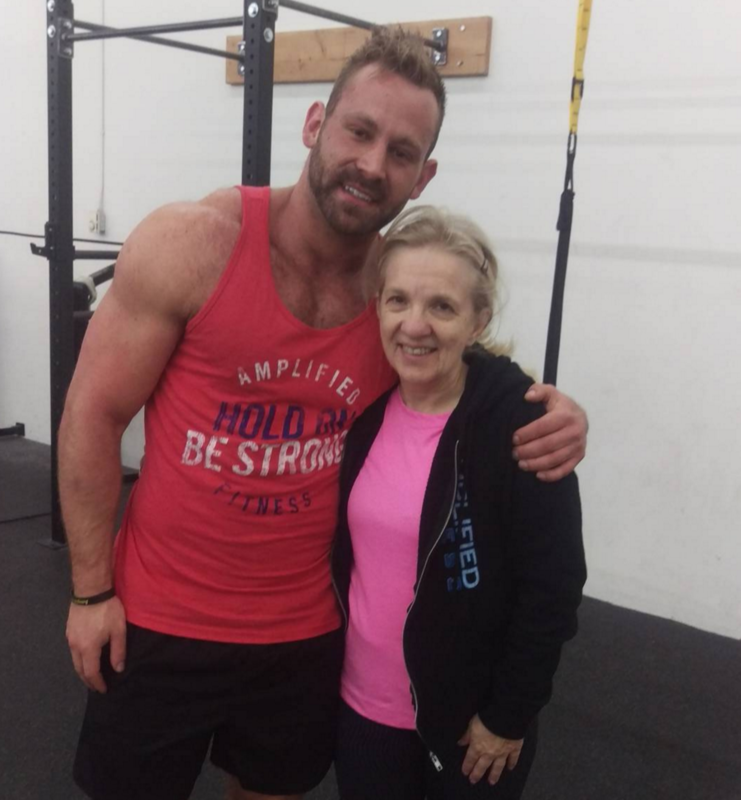 *Susan with head coach and owner Thomas after a tough workout! 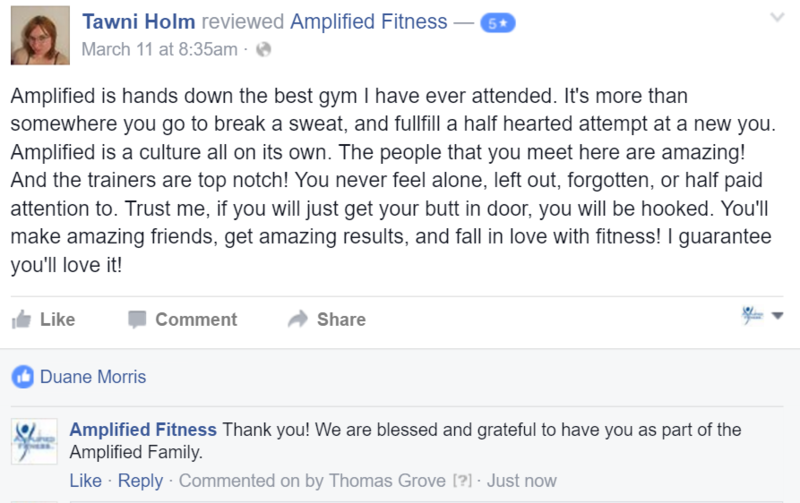 What do you like most about Amplified Fitness? The feeling, that everyone can succeed and do their best. I will never keep up with a much younger person, but I can succeed at my level. The gym is clean. The music has much to be desired, but that’s my age showing!!! If you had to, every morning before you were allowed to leave your house do 1000 calories on the assault bike or 500 wall balls? Are you kidding? I guess I would do the wall balls, but I would never get to leave it would take me FOREVER to do 500 wall balls and all my strength and time. What Would You Tell Someone That Was Considering Joining Amplified Fitness? I would tell people and have told people, join and take advantage of the trainers and equipment and do the best they can. Don’t compare yourself to others. Consideration and tips for Beginners. Posted March 8, 2016 by thomasgrove & filed under Uncategorized. Nothing will ever be perfect. Never will it be a perfect time to start. Don’t be a gatherer of information only to think about it and do nothing. The #1 tip for beginners is to get started. Success starts in your head. You have to believe in yourself. The desire for change has to be greater than the want to stay the same. Ask yourself why change is important to you? Sure you may want to lose some fat and tone up, but why? To live longer? To age gracefully? To have more energy to put into your career? To see your grandkids grow-up? To attract the best partner in life? To be the best version of you? Find out what the deep motivating factor(s) is for you, believe in yourself and you are on the right path to achieving your fitness goals. Don’t be a wuss but you need to ease yourself into training especially the first 2-4/weeks, and especially if you’ve been sedentary for 5+ years. You may have a burst of motivation right now only to have it diminished by trying to do to much too soon. Don’t be a hero. I know this is hard, especially if we were in really good shape at one point. Jog before you sprint, maybe you need to do your pushups off your knees, maybe you need do bodyweight squats before you put a bar on your back. Save the heart bursting, lung burning, red line workouts once you’ve established a base. On a scale of 1-10 via the rating of perceived exertion I recommend keeping yourself in the 5-7 range in your first two weeks of training and then 7-8 in weeks 3 and 4. You’re a beginner, good! Which means you’ve developed very few bad habits in your technique. You’re a fresh ball of clay ready to be molded. I love when I have a fresh new trainee void of years of doing things incorrectly. Take this to your advantage as a beginner and learn to do things correctly. Fitness is a lifestyle not a short term endeavor. No one has developed a fitness lifestyle in a matter of weeks or months. The sooner that you can understand how to create a program for long term success and do the things that come along with that, such as proper nutrition, movement prep, and passive recovery, the more successful you will be. To give you an example of proper programming here is one of many ways it can be setup. This way you see all the major muscles are being hit and allowed 48-72 hours of recovery. One workout does not significantly Hinder another. Posted February 29, 2016 by thomasgrove & filed under Member of the month., Uncategorized. March’s Member of the month is Katelyn Prawitt! Congratulations Katie on being chosen as member of the month! This means a coach has spotlighted you because they’ve noticed your incredible work ethic and value to you bring to our community. I had been following Amplified Fitness and Thomas on Instagram for a few months before reaching out to Thomas. When I finally decided to reach out to Thomas, I was really ready for a positive change in my life and needed lots of extra motivation. He was so quick to set up a consultation and informed me about exactly what to expect with his program. Generally, I like to weigh my pros and cons before committing to big decisions, or in this case, investment. I had been considering Amplified in the back of my mind for a while and after talking with Thomas and considering my goals, I signed up the same night! I knew that Thomas knew what he was talking about and truly had an amazing program. The success and struggles you have been through at Amplified Fitness? I have experienced a few struggles at Amplified. When I first started, it was hard for me to find time to “fit it in” my schedule. When, really, I just wasn’t making it a top priority. After I decided to make my health goals a top priority, making it fit my schedule (even if I have to go at 5:30AM!) became easy. All of my personal success I have had at Amplified Fitness can’t even be written down. I have become more confident in myself, let go of mental struggles, and gained a strong self-esteem. While the physical changes have been absolutely amazing, I feel most successful because I have gained so much mental strength and the ability to always believe in myself and my abilities. 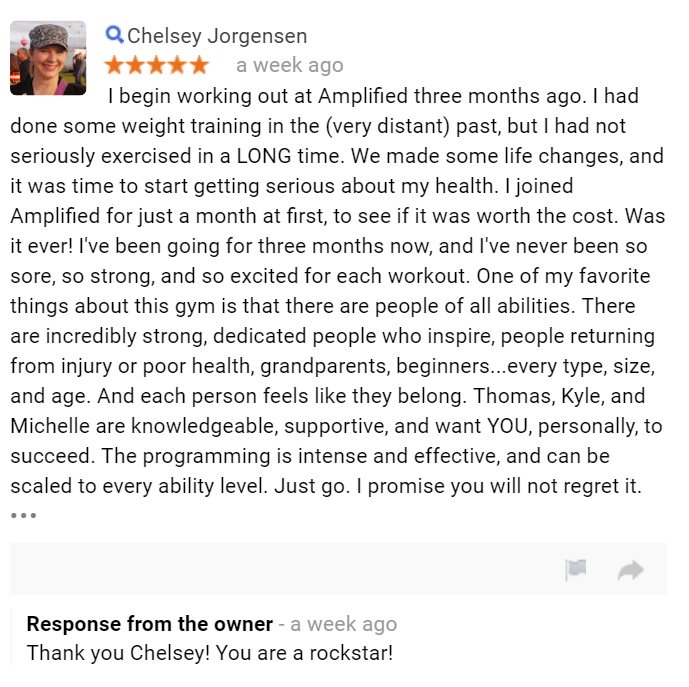 How often do you attend sessions at Amplified Fitness? I attend class at Amplified 5-6 times per week. I occasionally have to miss a Saturday session due to work; but, I try to make it 6 days a week, even if I have to go to an open gym session! Least favorite movement? Least favorite workout? Oh man, this is tough. Deadlifting is a huge struggle for me. But, I don’t hate it. When I see deadlifting on Wodify my thoughts usually go like this.. “Oh man……… wish me luck!” But, I haven’t failed the deadlift program yet! I don’t have a weight loss goal as of now but I would love to increase my strength in a lot of areas! I am training for a Spartan race in August and would like to become a better runner and continue to increase the number of pullups I can do! 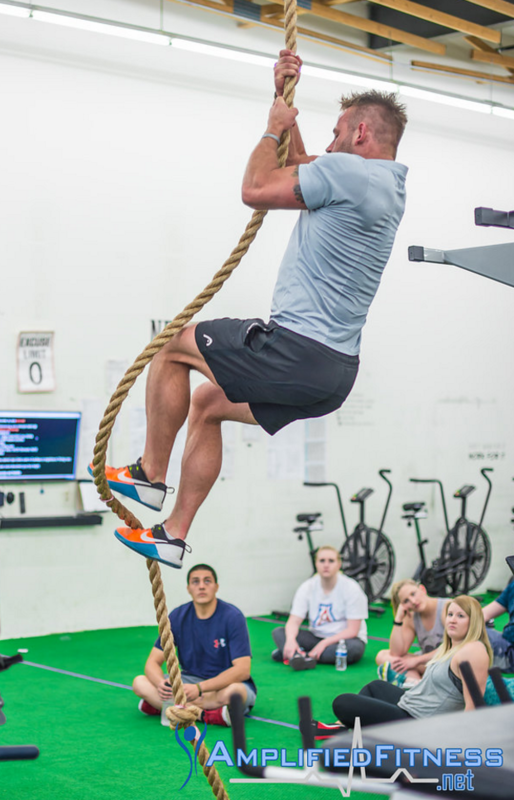 I also need to practice rope climbs. Anything else you want to share about yourself: what you do for fun, what you do for work? 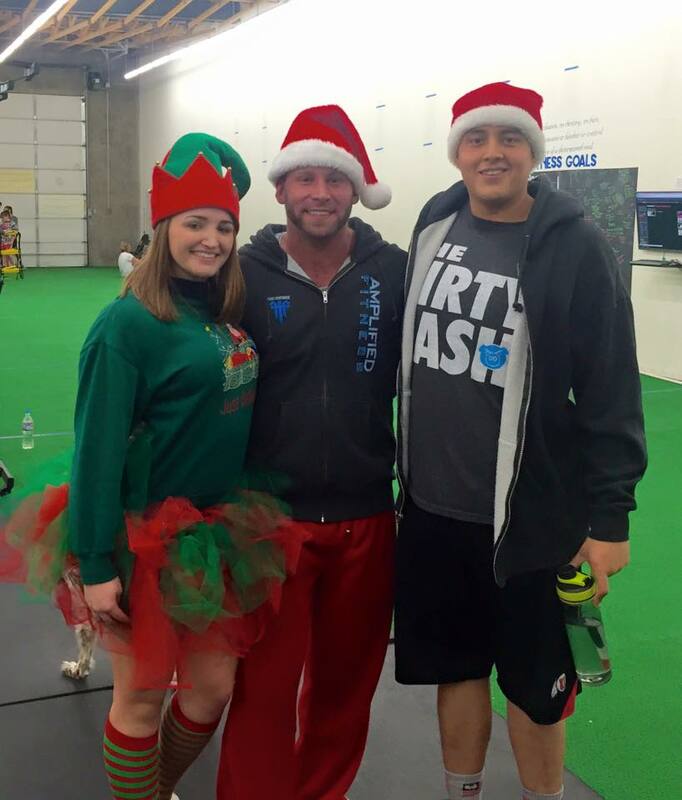 I coach cheer for Bingham High and I love using coaching techniques I observe at Amplified Fitness in my coaching! I also love to go out and dance with my girlfriends, go to concerts and I am pretty much in LOVE with singing karaoke! -What keeps you keep coming back for more? I’m pretty obsessed. I love all my gym friends and it’s probably pretty clear but I love some friendly competition! I also love that I am constantly challenged. I love that we all hold each other accountable and cheer each other on! I also love that every week I am challenged (and nervous!) and I NEVER feel like something is “easy”! EVER! There’s always ways to improve and challenge yourself. I don’t feel at all complacent at Amplified Fitness. Would you rather do 1 burpee every minute on the minute for 48 hours straight or drag a 100lb sled 20 miles while wearing a Chewbacca costume? Haha! Drag a 100lb sled for 20 miles while wearing a Chewbacca costume, FOR SURE. Reasons why: burpees are hell and that’s 2,880 burpees. No way!! Also, you could complete a 20 mile sled drag in less than 48 hours and I’m super interested in wearing a Chewbacca costume, I love to dress up! She’s not lying when she says she likes to dress up. Here is Katie dressing up the coach and other member on Christmas. DO IT! You really won’t regret your investment. Thomas, Michele and Kyle are all so motivating and have really helped move along all my progress. Investing in yourself will be your best decision yet. Investing time and energy in something that is constantly improving your mental and physical strength along with gaining knowledge about nutrition and fitness with benefit you endlessly! Posted January 6, 2016 by thomasgrove & filed under Uncategorized. 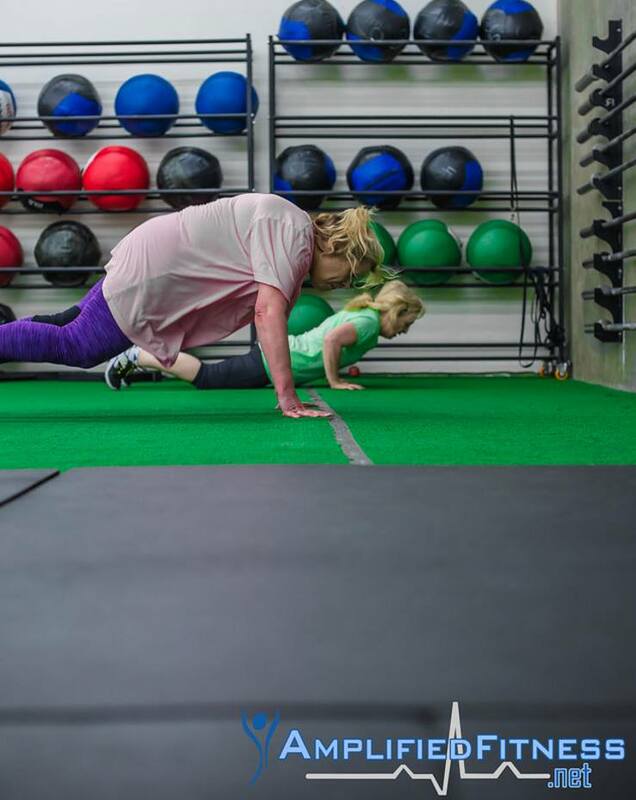 January’s member of the month is Debbie! Congratulations Debbie! We are so grateful to have you as part of our community. It has been a blast watching you transform! I fount out about Amplified Fitness through my great friend Janna. 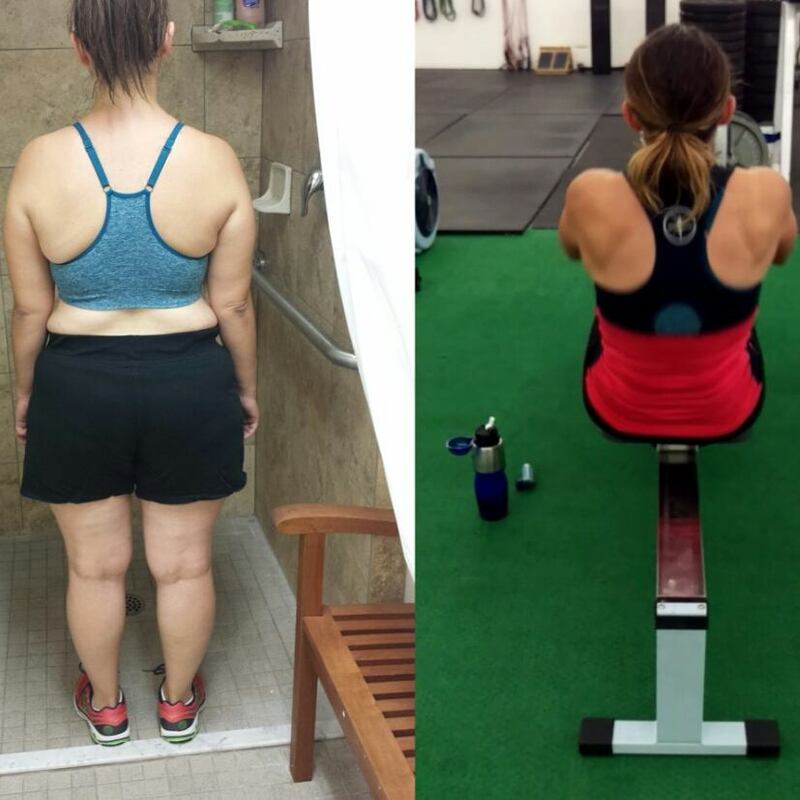 She got me to start initially with the boot camp in February last year but I still wasn’t super confident yet until August after having looked at several different gyms, I realized Amplified was my best option and that I needed to do something quick for my health and well-being. My greatest decsion for the year 2015! The struggle has honestly been just showing up and being confident in myself. I’m stronger, physically, and mentally than I want to give myself credit for. Success is that I finally don’t hate rowing! My confidence is growing and so is my strength! 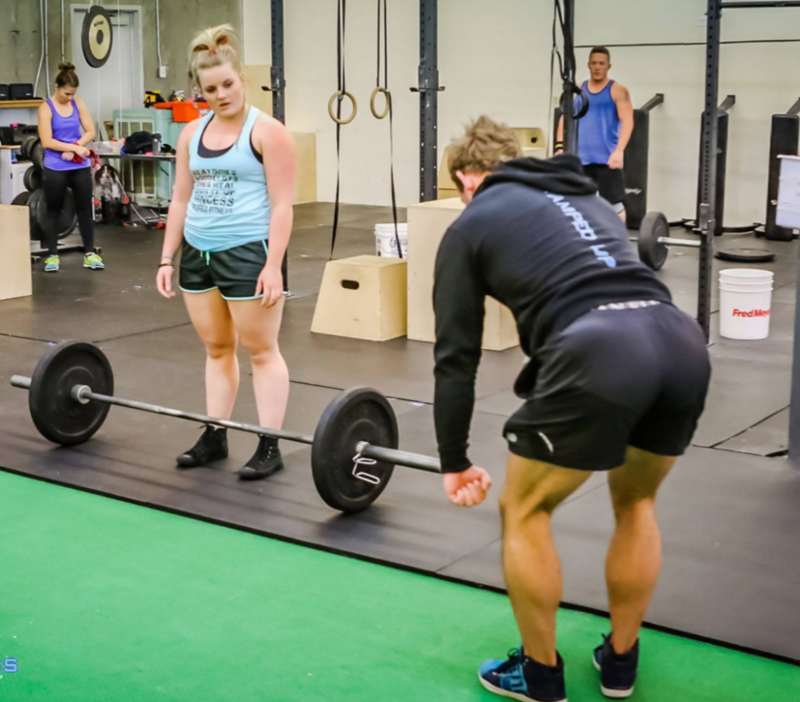 How often do you attend classes at Amplified Fitness? Bench Press however back squat is slowly becoming my other favorite! Least favorite movement is front squat and least favorite workout is probably Into The Fire hahaha literally feels like you are on fire but soooo good! My goals would be to get better at my front squats and jump rope oh and do a pull up before the year is over! I work at St. Marks Hospital as a heart monitor tech. For fun I love snowshoeing, hiking and watching a great movie! -Why you keep coming back for more? I could repeat what I said above but the other thing I love most about amplified that really helped me was the food program Thomas put together for me. Teaching me how to be healthy and mindful of what I put in and how to still live a normal life with aunts who like to cook amazing food! The recipes he puts together are legit! Would rather do 300 burpees nonstop or row 10,000 meters? 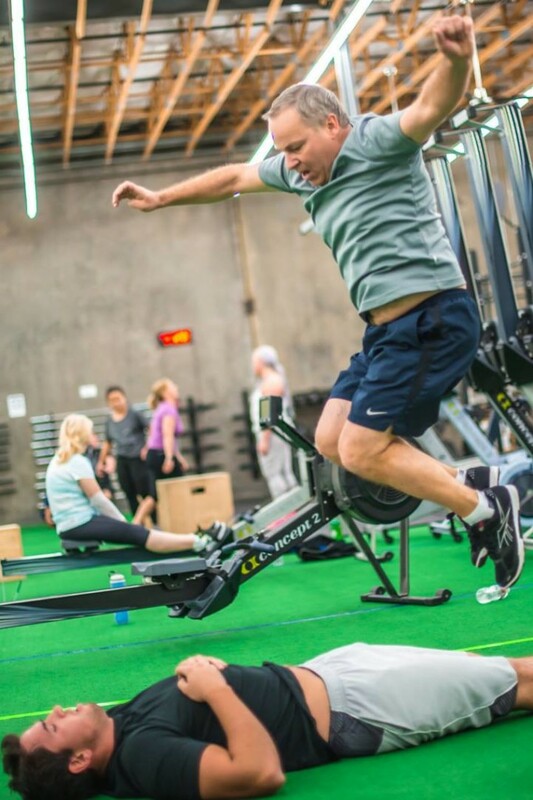 Oh hands down I would row 10,000 meters before ever doing 300 burpees! It’s challenging but totally worth it. The strength training is amazing and the combination that Thomas uses considers all fitness levels so that your confidence and strength builds quickly! December Member of the month. Posted December 16, 2015 by thomasgrove & filed under Uncategorized. -On the 21st will be 9 months as a member of Amplified Fitness. I originally came in one Saturday just to try out a class. Because a certain someone kept telling me that I’d like it if I just tried it. Ended up signing up after that first class. I felt like I needed to commit to something, especially if it was to better myself. -A success I’ve had is how much overall stamina and strength I’ve gained. And a struggle at first I would say was my eating habits. But after the 9 week challenge it has definitely helped me notice what I put into my body now. -Besides a select few Saturdays that were closed. I’ve attended classes every day that there has been a class to go to! -I would have to say that my bench is my favorite movement. Although it’s not a very impressive bench I hope to build it up! 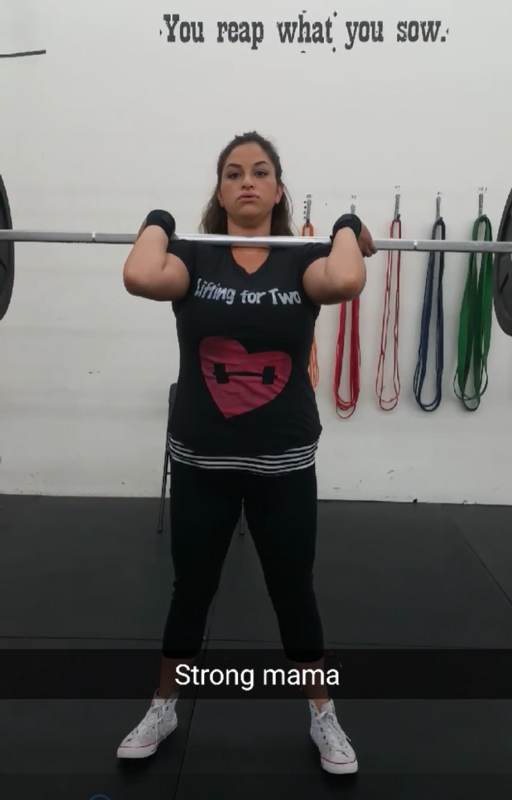 -My least favorite movement would probably be the strict press. Because it’s a struggle not being able to use your legs!! Maybe I should not dsay cause knowing Thomas he’ll probably make us do it soon. But my least favorite workout would of course be 99 Problems! -To pass my goal weight! Now that I’m as close as I am to my goal weight, I’m realizing that I’ve got a longer way to go..
*Photo Manny and Coach Michele. Incredible progress! -I would have said the gym but it’s not always fun haha I also like to play basketball for fun, go to concerts. And writing music. -I keep coming back for more because of the progress I’ve seen since joining Amplified! Just makes me hungrier to get into the shape I’ve never been able to get to. -It’s not going to be easy. But if you are looking to lose weight, build stamina, strength and self esteem. Then you should definitely go see for yourself! Posted November 13, 2015 by thomasgrove & filed under Uncategorized. 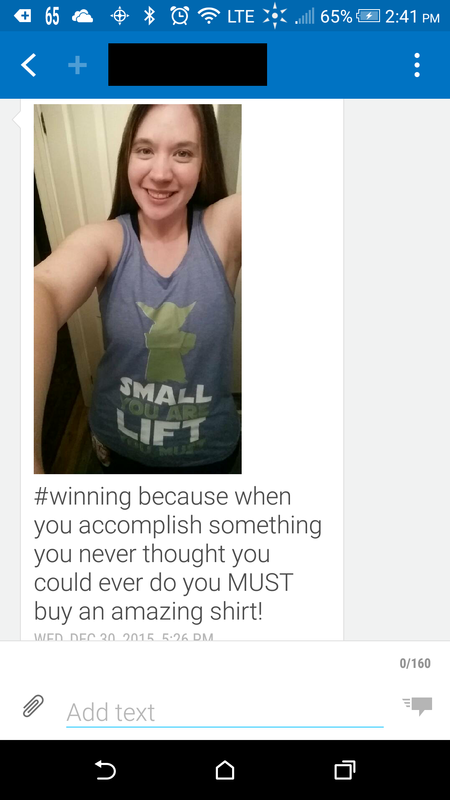 She’s lost 25lbs, gained muscle, improved on all her lifts and set a 16 minute PR on her half marathon time! Member of the month is Brenda Adams! 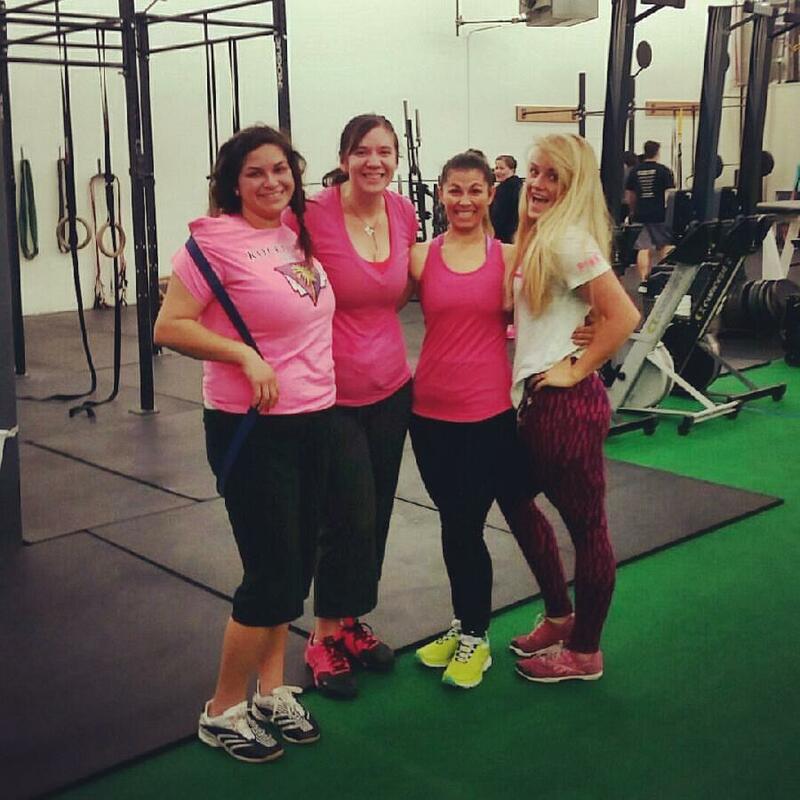 I had a sister-in-law talk me into buying a Groupon in Spring 2015 for Boot Camp at Amplified Fitness. Boot Camp was changed to the Strength and Conditioning class. 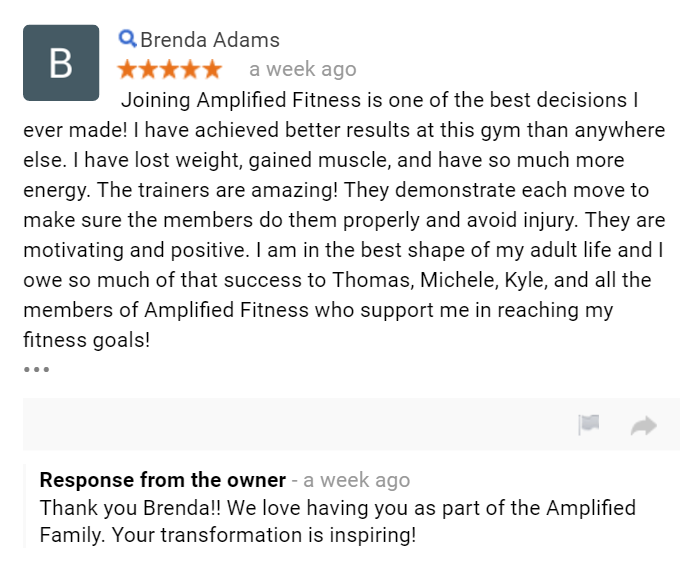 During the first two weeks, I recognized the benefit becoming a member of Amplified Fitness would bring to helping me achieve my goals of becoming healthier and losing weight. I have not been disappointed. In the 6 months I have been a member of Amplified Fitness, I have lost over 25 lbs, become stronger, and increased my confidence. It has also been great to watch other members improve and get closer or reach their fitness goals. 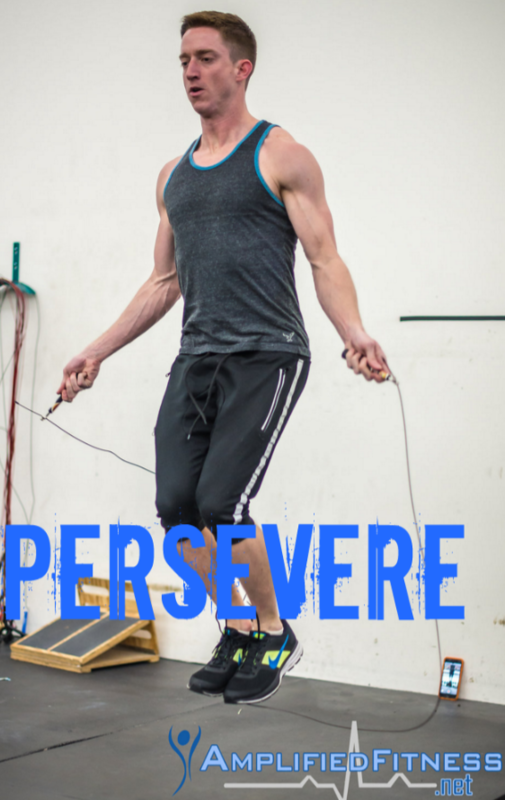 The success and struggles you have been through at Amplified Fitness. 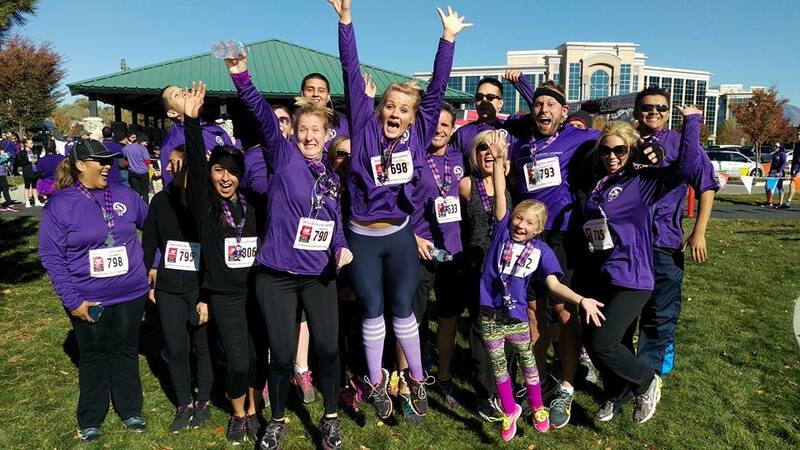 Success – When I joined Amplified Fitness my main goal was to improve my endurance and run a faster half-marathon. I was able to achieve that goal earlier this month and set a new PR. I shaved over 16 minutes off my previous PR and did very little training outside of the gym. Struggles – The only struggle I can think of is a couple of months ago I injured my leg which kept me from doing squats. It was frustrating to not be able to do the workouts and progress, but Thomas modified the workouts for me so I still received benefits from the workouts. 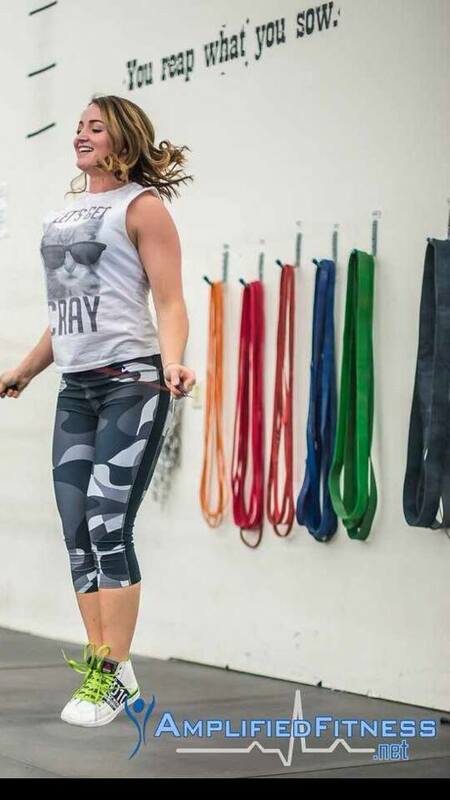 Least favorite movement – Shin hops (because I can’t do them so I “get” to do extra burpees when they are on the workout). Besides losing the remaining weight I have left to lose, in 2016 I want to be able to do pull-ups and shin hops. I am a manager at Utah Higher Education in the Operational Accounting department. For fun – I love to travel, hang out with friends and family, go to movies, hike or snowshoe depending on the season, and go to Utah football games. Go Utes!! Because Thomas and Michele push me harder than I push myself. They don’t let me give up. I have broken through fitness barriers that I never could on my own. Every time I tried to lose weight in the past, I would hit a plateau I could not overcome and I would give up. In the 6 months I have been training at Amplified Fitness, I have broken through that plateau and I know I will continue to progress. 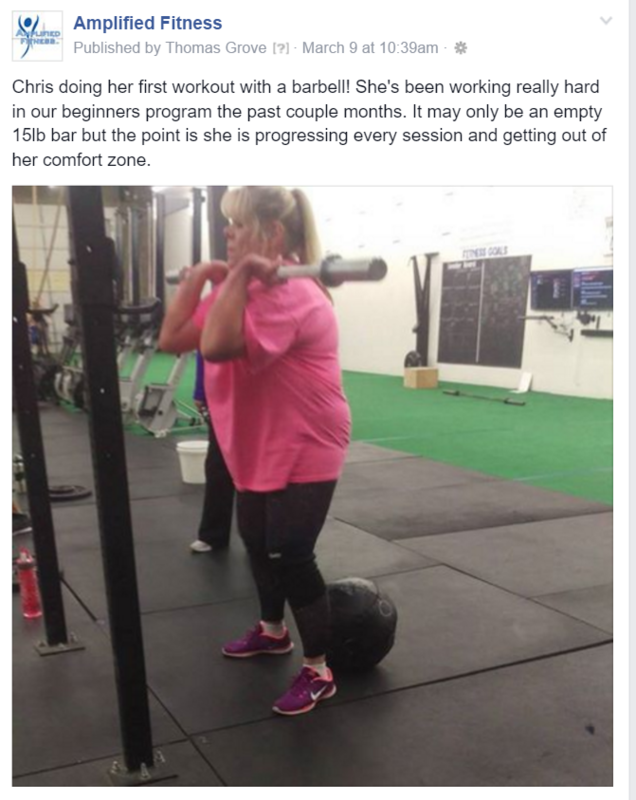 I think most people say this, but it is so true – the people at this gym are amazing! I know when I can come to the gym I will not only get in a great workout but have a great time doing it. It is such a positive atmosphere. 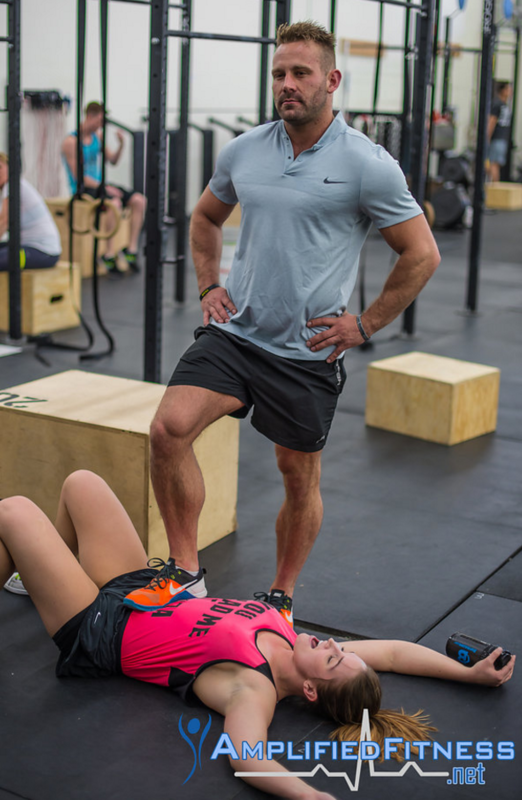 Not only do Thomas and Michele encourage you during the workouts but the other members cheer you on as well, which makes me want to push myself even harder. 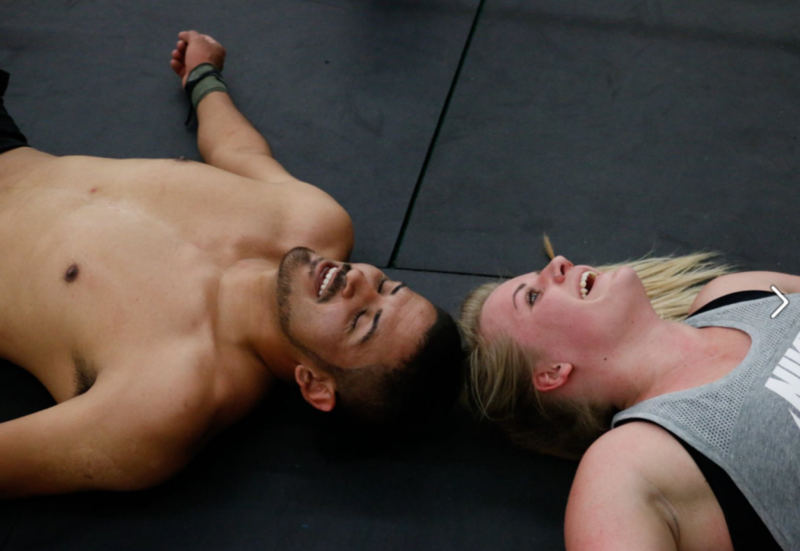 What Would you tell someone who is thinking about joining Amplified Fitness? It is the best investment you can make in yourself. The training program is set up for success if you apply yourself. Don’t let fear of the unknown be the barrier that keeps you from becoming your best self. The trainers and other members make it a fun and positive environment that makes you want to dig deeper and push yourself harder.